A while back I was organizing my nail polish collection and I came across a package of Sally Hansen Salon Effect nail polish strips in Skinny Jeans in one of the drawers. I remembered when I bought them that I was thinking I might never use them because why would I want my nails to look like denim (You'd think that would have stopped me from buying them, but nope! That makes too much sense!)? That's when a genius idea struck me--dip dyed denim nails! I've had dip dye on the brain ever since I DIY'd my jacket so why not transfer the look to my nails? 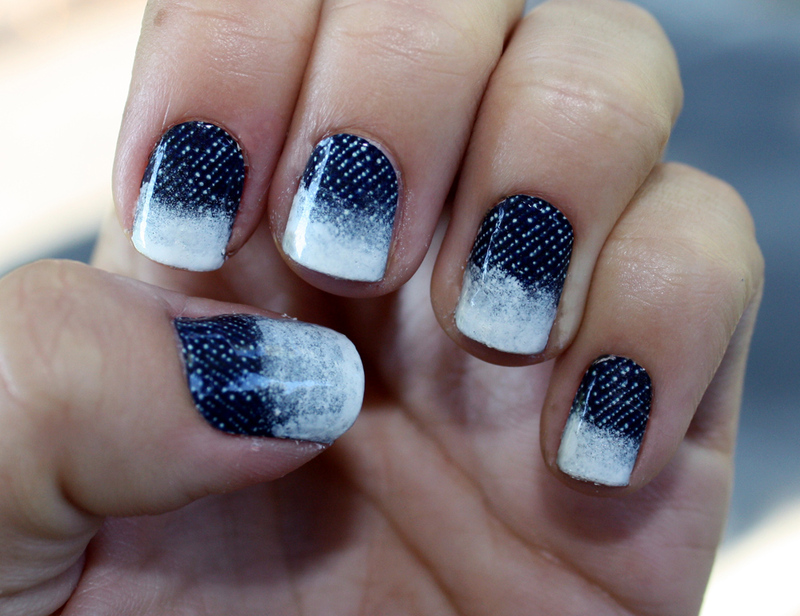 To get this look, I applied the denim-patterned strips to my nails. Next I applied white nail polish in layers using a small makeup sponge. I used the brush of the polish to swipe a tiny bit of opaque white at the top. To make it last, I added a coat of my favorite top coat! Rocks Paper Metal giveaway ends soon! LOVE LOVE LOVE! How creative of you! I definitely want to try this! What great inspiration & they turned out really well! !